Select division page items sold do not qualify for a discount. Total purchases less division purchases will have applicable discounts. Before sending a payment, please reserve your order by E-mail, regular mail, or phone. If you E-mail, mail, or phone, please indicate a number where you can be reached so that we can confirm you order. In the event you have E-mail, a E-mail confirmation will be sent within twelve hours. A phone call will be rendered for all other orders within twelve hours after receipt of your request. Remember first come, first served. We strongly recommend making a reservation in advance, as availability of many items is limited. please replace at with @. Sorry for the inconvenience. Orders are shipping as soon as possible after receiving your order. After payment is received or your credit card is approved, we will pack and ship your order. Inclement weather conditions can delay shipping and you would be notified in the event a shipment was held. Please specify a desired ship to address. All orders are shipped by Priority US Mail, unless other arrangements are requested. Carrier costs other than Priority US Mail are not included in any special that offers free shipping. If you request shipping by other means, you will need to provide your own Fed-Ex or UPS account number and allow us to arrange for pickup here at the greenhouse. You will also be responsible for any claims or disputes with your Fed-Ex or UPS carrier. For shipping via US Priority Mail, please include $20.00. Large shipments will be billed at cost. All orders are insured. Plants may be returned within five working days if not satisfied. This guarantee includes plants damaged in the shipping process if US Priority Mail service is utilized. Contact us within the five day inspection period to let us know the plant/plants are on their way. The customer is responsible for the safe return of the plants and the shipping costs. A refund check or credit card refund will the issued and mailed to you after the plants are returned. Plants in bud will be sent whenever possible and because bud blasting can occur due to sensitivity to shipping and environmental changes there is no guarantee against bud blasting. We will ship plants in low or tight bud whenever possible. If plants not in bud are preferred, please let us know. Packaging: Your order may be delivered in a used box with various types of packaging material. We recycle as much as we can to reduce waste and benefit the environment. Thank you for your understanding. We have no hidden box or packing charges. RETURNED CHECK POLICY: Should your check be returned for insufficient funds, accrued bank charges against our accounts will and other charges may be passed along to the checking account holder. 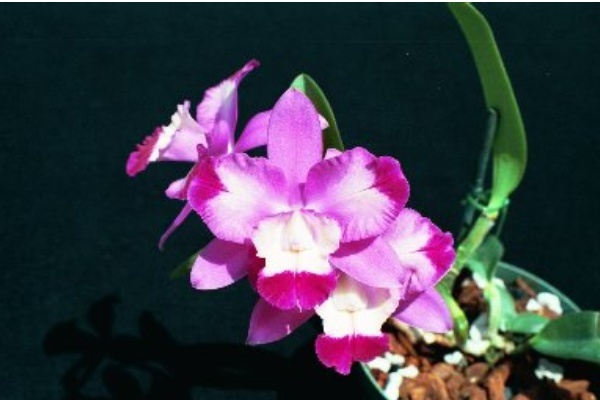 NON-WARRANTY: Seagrove Orchids gives no guarantee, implied or expressed as to the productivity of any plants we sell and will not in any way be responsible for future bloomings or the quality of flowers produced from seed. Hybrid crosses are speculative and it is impossible to predict with certainty the outcome of progeny. If a description is given it will be my best guess for a particular cross. We cannot guarantee that the limited divisions are virus free, but we make every effort to keep our growing plants clean and growing vigorously.